We hear there's a new vampire on the block. We can only imagine (by the pale skin and long fangs) that the new vampire is you. Welcome to the neighborhood. But you should be warned. This block? Technically it's Dracula's domain. He's got dibs on all the locals from this side of Transylvania to the mountains. So if you're moving in... well, you might want to at least talk to the Lord of Vampires. We hear he can get a little upset if uninvited vampires show up in his turf. That's right, just go talk to the guy. Let him know you're visiting or in the area for a party or whatever... but for heaven's sake, don't go looking like that. Do you want Dracula to take you seriously or not? You see, Dracula is old school. No nice three-piece suit will do. He's going to want something more in the classic Gothic style. You know. The one he established as typical vampire-wear. 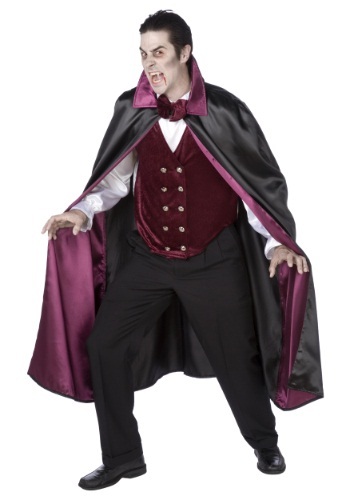 Yes, something like this Deluxe Vampire Costume would be perfect! It's got the fancy satin shirt and pants, with velvet vest attached. There's silver buttons (don't worry, not actual silver, we're not trying to kill you or anything!) and the iconic cape with tall collar and some red lining. Put this on and you'll practically be welcomed into Dracula's court as a fellow vampire lord. Now, isn't that an idea you can just sink your teeth into?